What goes to work in the morning, comes home in the afternoon, and wins big money on slots at night? Click here to play! The answer to that question could be you if the Sphinx Hijinx slots hit 3 Sphinxes in a row and you play 3 coins per spin. BAR symbols are the building blocks of your ancient empire in this slots game, but from them you could eventually build pyramids, tombs for pharaohs, and even the impressive Sphinx statue. The Sphinx is known to be a devious creature, but locked in this slots game it is kept in check, so you need not worry about deadly riddles or lion's claws. Just keep your eye out for a massive payout! 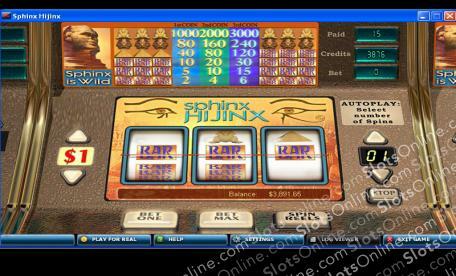 Play the Sphinx Hijinx slots today to get a taste of the incredible riches of ancient Egypt. The Sphinx symbol is wild, and it can substitute for any other symbol in this game.